Product prices and availability are accurate as of 2019-04-20 02:53:34 UTC and are subject to change. Any price and availability information displayed on http://www.amazon.com/ at the time of purchase will apply to the purchase of this product. Experience the revolution of coffee. 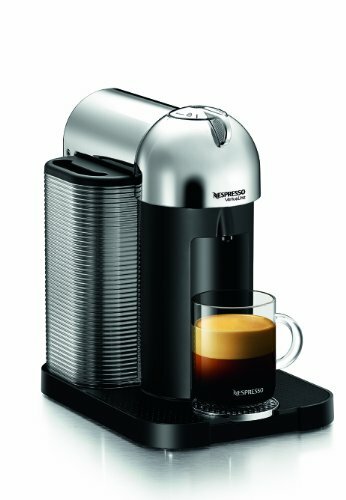 Meet Nespresso VertuoLine, a groundbreaking new way to enjoy freshly brewed coffee as well as rich, authentic espresso at the touch of a button. Thanks to completely redesigned capsules and an innovative new brewing system, the Nespresso VertuoLine brews both genuine drip-style coffee and espresso. Revolutionary Centrifusion technology instantly recognizes each capsule and automatically adjusts brewing to bring out the best of each blend. Customizable cup sizing-from 0.3 ounces up to 17 ounces-allows you to tailor brewing to your needs, whether filling a travel mug or brewing just a little bit more. Less than one percent of the world's coffee meets Nespresso's uncompromising standards, ensuring that your cup, is nothing short of coffee perfection. Full-bodied Nespresso coffee improves on traditional drip coffee with silky, aromatic crema that enhances every cup, and thanks to a wide range of capsules, you're sure to find the brew that's right for you. Unmatched convenience, impeccable results-Nespresso VertuoLine is smarter coffee. Includes: VertuoLine sampler (8 coffee, 4 espresso). Material: Plastic, metal. Care: Wipe clean. Use: For use with Nespresso VertuoLine capsules. Not compatible with original Nespresso capsules. Made in Switzerland. FEATURESInnovative dual-capsule design brews great-tasting crema-enhanced drip coffee or rich espresso-a first for a one-touch capsule machine. Centrifusion technology scans each capsule and automatically adjusts brewing for a revolutionary one-button experience. Capsules insert easily and automatically eject into a container that holds 13-20 used capsules. Incredibly fast, 15- to 20-second heat-up ensures that delicious coffee is just one button push away. Automatic shutoff after nine minutes of inactivity. Enjoy two pre-set cup sizes-coffee (7.77 oz.) and espresso (1.35 oz)-or customize brewing between 0.3 oz and 17 oz. High-capacity water tank allows you to brew more without refilling.